Good morning ladies and gents! Another dessert! WOOHOO! Seriously, this is getting a BIT out of control. I mean, these may not go live back to back but I have literally made 4 desserts in less than a week. It just happened that way. Good thing I have lots of family to share with! Before I get started, take a look at the piece I cut out and the place I cut it from. Seriously? I can't even cut a proper triangle? Very sad. BUT interesting, right? HA! Oh and one more TINY thing. This is officially my 500th post! What does this mean to me? It means 500 times I have sat down at my computer to share food, fun, love, and memories. I have made loving fun of nearly everyone in my family, and I have been able to share it with you, my Chefwannabe family, the extension of my real family. Thank you for every bit of support, every ounce of advice, every teaspoon of criticism, even ever single gulp of pride. I love you all, I respect you all, and you are pure joy in my life. How many people get to be so blessed? I count myself as one of those who are! Crazy love to you every single one of you! This ricotta cheesecake has been so long coming. I have eaten it several times, back in the land of my Italian family and friends! HOLLA South Jersey! I have just tried to make it myself. You will see it is so easy to make. I mean, I used to be all intimidated by cheesecake. Shhyeeaaahh, not anymore. I had no recipe for this cheesecake. In fact, I picked a part a few recipes I found and ended up ditching half the ingredients I came across. I decided to fly with it, go with my gut on this one and it worked. I mean, come on food bloggers and home cooks alike, how many times do you "get it" on the first try? Exactly!. And then I decided to take the "no water bath" part from the Cake Boss and see if it really worked. I figured if it cracks, and tastes like crap I learned two lessons in one day! 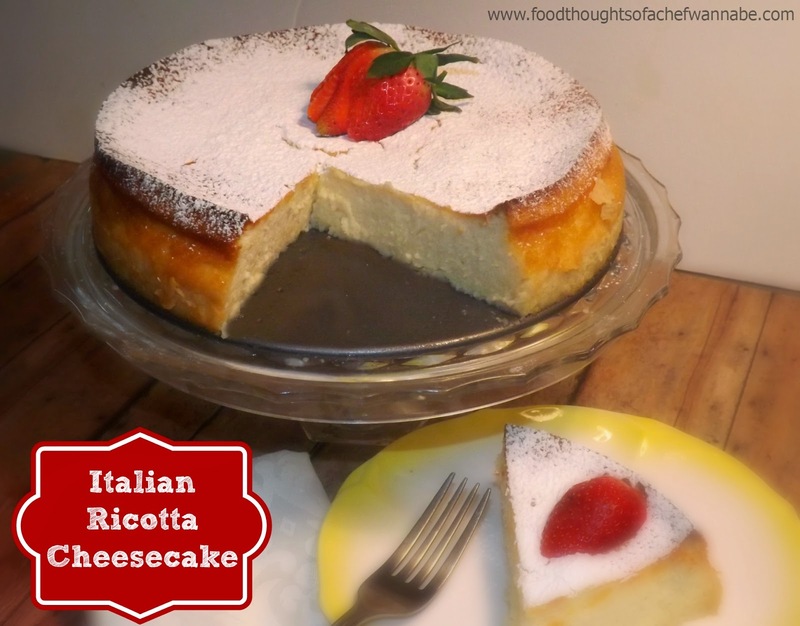 Now, for anyone has never had a ricotta cheesecake. Do not expect the texture of a regular cheesecake. It is the same slight sweet flavor, I omitted the lemon, (ugh with the lemons already) and probably left out the most vital Italian ingredients. But this turned out awesome and I had to share it with you. The consistency is a bit grainy, maybe not grainy, hmm...what is it. It has texture, where regular cheesecake it just smooth. This is much lighter than a New York cheesecake so if you don't like the dense cheesecake this might be for you. If you don't like light cheesecakes this may STILL be for you! Give it a try, and if you feel so inclined, add the lemon zest, but you aren't going to find it in my recipe! Preheat your oven to 450 degrees F. In your stand mixer or with a hand mixer, beat egg whites to a medium peak. If they go a bit further, no biggie, just get them to at least medium peaks and set aside. This part I do in the food processor, but you can easily just do it with a bowl and a spoon. In a large bowl or the food processor, add in ricotta cheese, egg yolks, heavy cream, sugar and vanilla. Mix until combined, or process until smooth and combined. Transfer to a large bowl if you need to. Carefully, fold the egg whites into the ricotta cheese filling, in 3 editions. You don't want to lose all of that beautiful fluff! When it is completely combined, butter a 9 inch spring for pan WELL. Bottom and sides. Pour the cheesecake mixture into the spring form pan, and then give it a slight tap or two on the counter to get out any air bubbles. Now place into the oven and IMMEDIATELY turn your oven down to 350. Let back 55 minutes. and then shut the oven off. DO NOT, I repeat DO NOT open the door and it shouldn't crack! No need for the pain in the rear water bath! When the 55 minutes is up, slightly crack the oven door, and shut off the oven, let the cheesecake sit in the oven until it comes to room temperature. Chill for at least 2 hours. I chilled mine overnight. Run a knife around the edges, and remove the sides of your spring form pan. I heavy hand the powdered sugar on top, because, well, I like too! Enjoy this delicious and unique dessert that will make you look like a rock star! Have you made it using granulated stevia or splenda? It looks just amazing! I'm off to the grocery store! No Lin I have not, however, I don't see it being a problem at all! Let me know if you try it and how it turns out or post a photo on my social media!! Thanks for the comment and stopping by!